Despite being only 80 minutes, Nessah Muthy’s new play Sundowning feels a lot longer. Repetitive and slow, it captures the misery of a family struggling with dementia and the guilt and sadness surrounding it. Homeless Alyssa (Aasiya Shah) reappears after time in prison. Her dearly loved grandmother has early on-set dementia and she wishes to visit. She appears at the door of her aunt Teresa (Nadia Nadif) where she is not welcome. Betty (Hazel Maycock) has been taken to a care home, concerns about abuse, mental health and loneliness rear their heads, but mostly it is a melancholy piece about how dementia tears apart relationships and erodes the personality of the sufferer. Love is a key theme – blurring familial and romantic love with a confusion that displays the unexpected difficulties of caring. But comic moments are few and far between and fall short of being any kind of relief. The soundtrack is thoughtful and effective with a melancholy white noise blending into memories of 1960s pop. 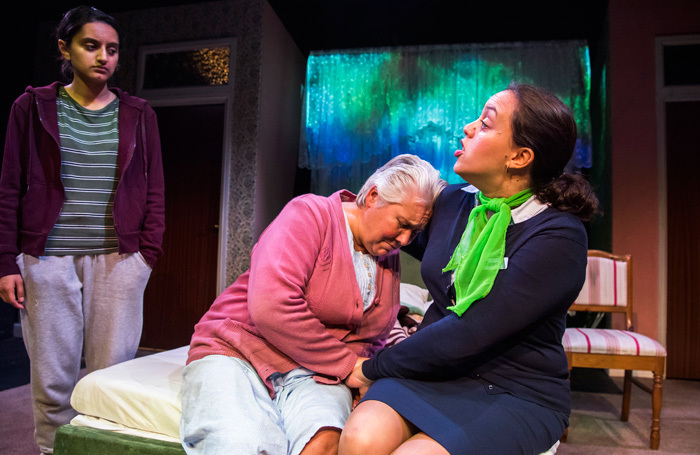 Video and a moveable set aptly transform the stage from care home to caravan when Alyssa and Betty have one last “holiday”. Betty is played with loving detail by Maycock. But Alyssa and Teresa’s characters lack depth and while we get an in sight into their tumultuous relationship, the play only briefly touches on their current lives – which, from the nuggets of dialogue we do get, seem more intriguing. For a play about women and their relationships, there are few conversations that aren’t about the dead grandfather and not enough about Alyssa’s dead mother. It would have been interesting to learn more about the women. Copyright © 2017 The Stage. All rights reserved.